International student recruitment is a core part of enrollment plans at many colleges and universities for reasons that range from diversity to international status to revenue enhancement. Competition is fierce. And the home pages for potential international students often are the first place that competition begins. Making a strong first impression is as important here as anywhere. The University of Sheffield presents international visitors with an easy-to-scan array of task links, starting with available academic programs at undergraduate and graduate levels. Immediately below the academic program links is a can’t miss link to “Start here: choose your country.” An unusual touch… the single country info often starts with the year the first person from a particular country was known to have graduated, quickly highlighting what are often long-term relationships. A special section for European Union students. “British education at its best,” promoting The University of Sheffield brand. “Financial help” via scholarships and awards. Content placement note: I especially liked that the available academic program content is placed ahead of the self-promotional “British education at its best” brand content. Brand promotion certainly has a place… but it should not have priority over more important top task content. Google Test My Site gives the Communications page a “Fair” 6 second mobile speed rating, estimating a 24 percent visitor loss from download speed. 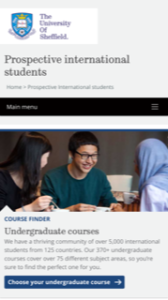 Experience a strong, easy-to-scan home page for international student recruitment at The University of Sheffield. Join 611 people on the Top Tasks: Higher Education Website Content group on LinkedIn.